The U.S. delegation at the 26th General Conference of Weights and Measures where 54 countries voted to redefine four of the seven base units for the International System of Units (SI). L-to-R: Eric Lin, director, Material Measurement Lab, NIST; Claire Saundry, director of International and Academic Affairs Office, NIST; Willie May, U.S. member of the International Committee on Weights and Measures and former NIST director; NIST Director and Undersecretary of Commerce Walter Copan; Barbara Cordero, finance analyst, Office of Management Policy and Resources, IO, Department of State and James Olthoff, Acting Associate Director of Laboratory Programs, NIST. Versailles, France—A convocation of delegates representing 60 countries voted today in Versailles to implement the most significant change to the International System of Units (SI) in more than 130 years. For the first time, all measurement units will be defined by natural phenomena rather than by physical artifacts. The event was the 26th General Conference of Weights and Measures and was hosted by the International Bureau of Weights and Measures. While consumers and most industries will not notice immediate impacts, scientists expect the change ultimately to inspire new technologies and to reduce the cost of calibrating industrial processes and scientific instruments. 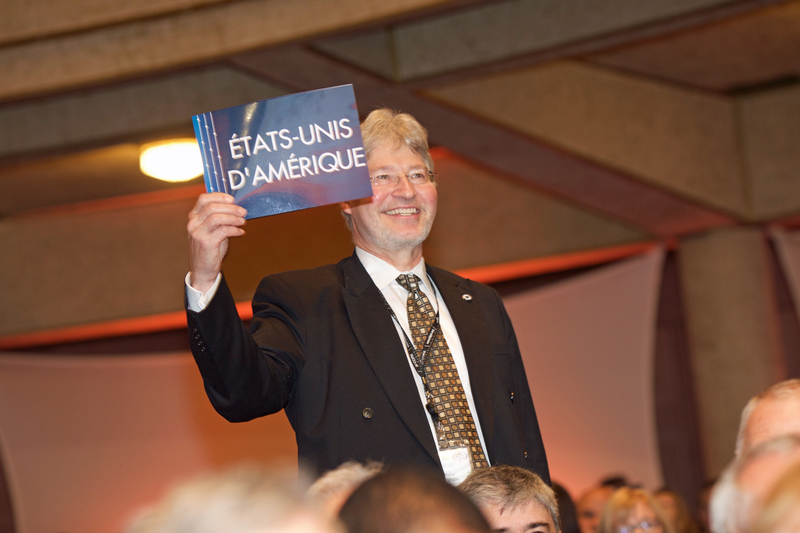 Undersecretary of Commerce for Standards and Technology Walter G. Copan votes yes on the resolution to redefine the International System of Measurements at the 26th General Conference on Weights and Measures today in Versailles, France. Delegates representing 60 nations passed the resolution unanimously. Currently, there is only one true kilogram, known as Le Grand K, which is secured in a vault outside Paris and used to calibrate all measures of mass throughout the world. Made of platinum-iridium, Le Grand K, like any alloy, may change over time by absorbing molecules from the air or losing them through cleaning. However, even these incredibly tiny changes mean that the artifact is no longer accurate enough for anticipated future advanced research and technological applications. Over the last 40 years, with the advancement of quantum science, scientists have now measured natural constants such as the speed of light and the Planck constant with exceptional accuracy. Using combinations of these constants and the equations of quantum mechanics, scientists created revised SI units for measuring mass, electric current, temperature and the mole that are at least one million times more stable than artifacts like Le Grand K.
Scientists have dreamed of having an accurate and precise measurement system that could be realized anytime, anywhere, since the 1700s. Scientific advances in quantum science, many of which have occurred at NIST and other NMIs around the world, have finally made this possible. Quantum phenomena that are identical everywhere are already used to define the second, which is the SI unit for time, and the meter, the SI unit for distance. The second is defined as 9,192,631,770 natural oscillations of microwave radiation released by the element cesium and the meter is defined as the distance traveled by light in vacuum in 1/299,792,458th of a second. These revised definitions, implemented in 1967 and 1983, respectively, were necessary for the invention of GPS and many other modern technologies. In May 2019 when the revised definition of the kilogram is implemented, it will be based on three fundamental constants: the Planck constant, the speed of light and the cesium atom’s natural microwave radiation. The Planck constant describes the size of the packets of energy or quanta that atoms and other particles use to absorb and emit energy. The current kilogram mass exerts a specific amount of force in Earth’s gravity. The revised definition replaces this determination of mechanical force with an electromagnetic measurement tied to the Planck constant and based on electrical current and voltage. Using an instrument called a Kibble balance, after its inventor Bryan Kibble, an electric current is generated in a coil to produce a magnetic field strong enough to balance a mass of one kilogram. The method requires a precision measurement of local gravity, which varies depending on elevation and several other factors. It also requires moving the coil through a magnetic field of known strength and and at a known speed, hence the tie as well to constants used to determine time and frequency. In a similar way, the SI unit for the ampere will now be based on the constant for the charge of the electron. The kelvin will be based on quantum-level measures of atomic motion and will be tied to the Boltzmann constant that relates an object’s energy to its temperature, as well as on the Planck and cesium frequency constants; while the mole will be based on an improved value for Avogadro’s constant. According to Pratt, the two industry sectors most likely to benefit fastest from the redefinitions are electronics and pharmaceuticals. The current SI unit for the ampere is impractical to realize, and as a result, precision electrical measurements have been based for 30 years on quantum measures such as the quantum Hall effect and Josephson junctions that generate quantum voltages. The change puts electrical measurements back into the SI where all other measures are made. Pharmaceutical companies are now measuring mass at microgram levels, which is only a millionth of a kilogram. Once the kilogram is redefined in quantum terms, they gain a measurement unit that is smoothly scalable down to the level they need for better drug design and study, with far less uncertainty. This capability to more accurately scale measurements from the quantum level to the massive sizes of galaxies is a key advantage as well for the other newly revised SI units based on natural constants. For further information visit NIST’s SI Redefinition website.